An inagural swim begins as opening ribbon is cut. Photos by Gisela Merino. The first swimmers dove into the new heated, Olympic-sized Belmont Plaza Temporary Pool Thursday during an opening ceremony attended by community members and local leaders. The waters were filled with swimmers young and old, thrilled to have a public pool after the permanent closure of the Belmont Pool Natatorium in February. The natatorium was slated to be rebuilt after an analysis deemed the 40-plus year-old structure seismically unsafe in the event of a moderate earthquake. Made of stainless steel and lined with vinyl, the new temporary pool sits in the parking lot to the east of the original facility and can be modified to have 10 50-meter lanes or 18 25-meter lanes based on the needs of recreational lap swimming, water exercise classes or competitive swimming programs through all seasons. Long Beach Swim Club members taking a swim Thursday evening. 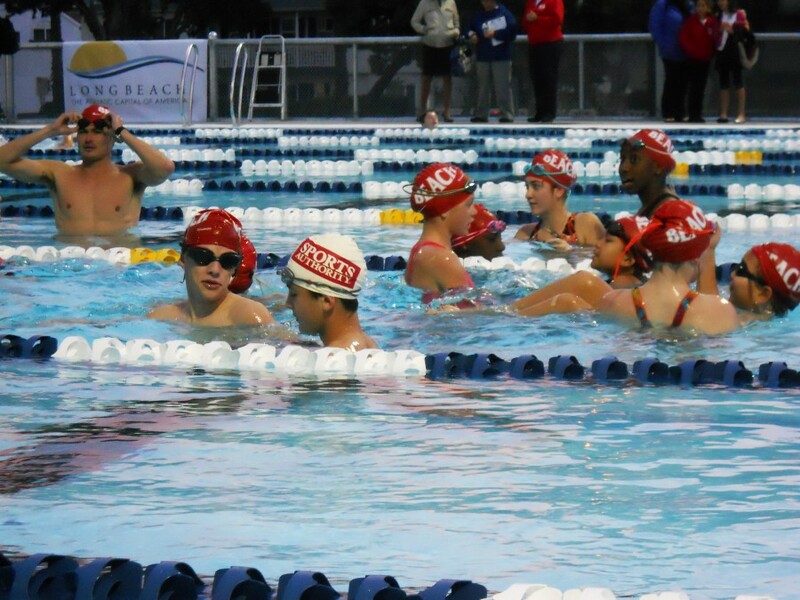 The open-air pool was implemented by the Long Beach Department of Parks, Recreation and Marine in conjunction with the Aquatics Capital of America group, spearheaded by the City Manager Office. It was constructed in six months using $5 million in city funds. According to Parks, Recreation and Marine Director George Chapjian, in approximately one-and-a-half to three years, the Belmont Plaza Temporary pool will be reconstructed and incorporated as a sister facility that will be the new, neighboring natatorium where the currently decommissioned pool stands. 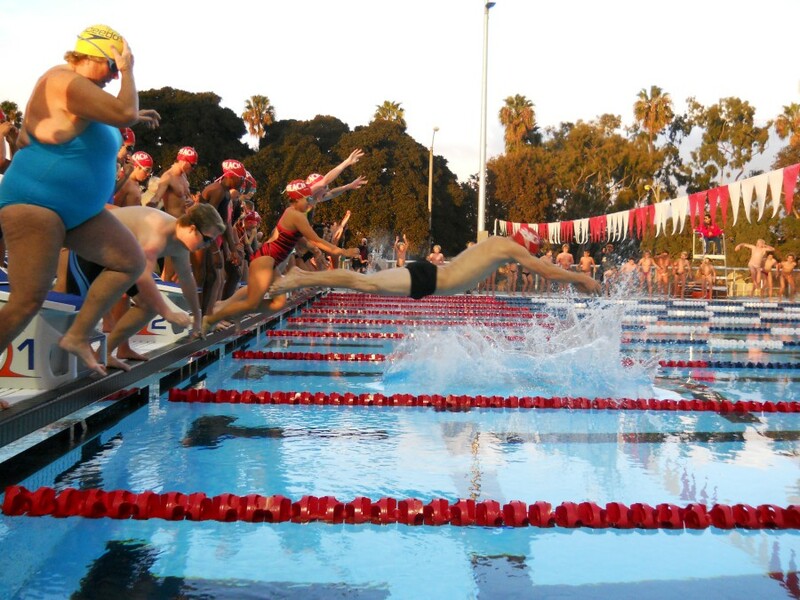 Visitors dived into the pool immediately following the late afternoon ribbon-cutting, with divers ranging from recreational swimmers, to former Olympics athletes and the Wilson High School swim team. “It’s great–there’s kids everywhere,” said long-time swimmer Lynne Cox after the inaugural dip into the temporary pool’s 80° F waters. For Belmont Plaza Temporary Pool fees and hours, visit Longbeach.gov/park.